This newest version of Coach's Cora Domed Satchel is wrapped in brown Signature C printed PVC coated canvas with black leather trim and golden tone hardware. This mid-sized dome is lined interior features a zippered pocket and two open slip pockets. Coach's creed and authenticity patch is sewn inside. There is a dual pull zippered top closure. The front is accented with Coach's logo lozenge, and the back has a small open slip pocket. Black leather banding runs along the lower edge providing a very classic and tailored look. There are dual handles with a drop of about 4 inches, or you can use the longer, removable and adjustable shoulder / cross-body strap. It measures approximately 12.5 inches (L) x 9 inches (H) x 5.5 inches (W). 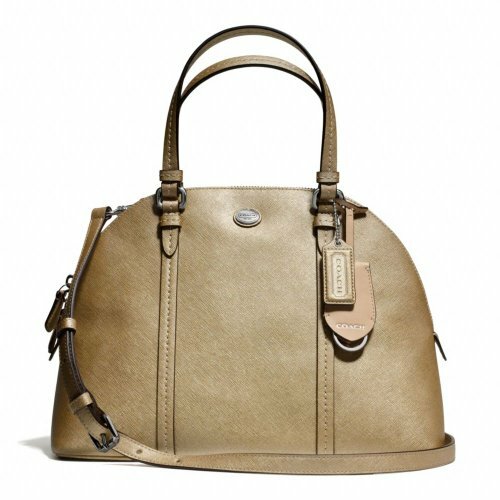 Coach's MINI version of this Peyton Cora Dome Satchel is wrapped in brown Signature C printed coated canvas with tan leather trim and brass tone hardware. The compact lined interior features a zippered pocket and an open slip pocket. 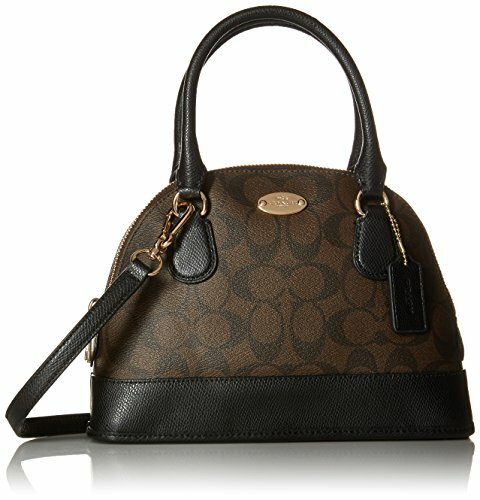 There is a zippered top closure and the front is accented with Coach's logo lozenge. There are dual handles with a drop of about 5 inches, or you can use the longer, removable and adjustable shoulder / cross-body strap. It measures approximately 10 inches (L) x 7 inches (H) x 3 inches (W). Wrapped in sand tone Saffiano leather with polished brass tone hardware. This Cora Domed Satchel has a lined interior with a zippered pocket and two open slip pockets. Dual handles have a drop of about 5", or you can use the removable and adjustable shoulder / cross-body strap. Overall measurements of approximately 12 1/2" (L) x 9" (H) x 5 1/2" (W). Coach's Cora Domed Satchel is crafted of vibrant Pink Ruby cross-grain finished leather with polished golden tone hardware. 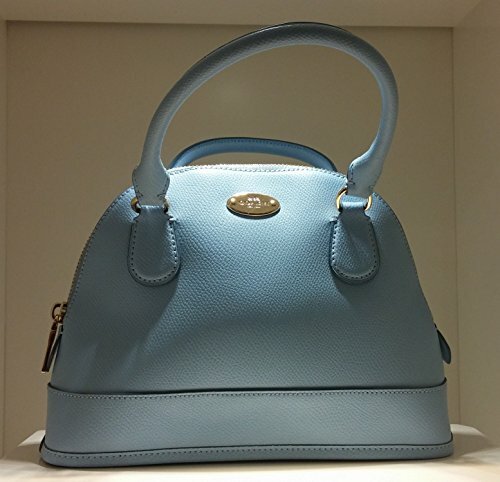 Coach offers this dome satchel in several sizes and this is the largest. The lined interior features a zippered pocket and two open slip pockets. Coach's creed and authenticity patch is sewn inside. It has a fully zippered top closure with dual zipper pulls, and Coach's logo lozenge accents the front. A small open slip pocket is on the back, and there's a removable Coach pink leather hang tag. There are dual handles with a drop of about 4.5 inches, or you can use the longer, removable and adjustable shoulder & cross-body strap with a drop of between 20-24 inches. This gem measures approximately 12 inches (L) x 9 inches (H) x 5 inches (W). It is made exclusively by Coach for distribution in their Coach Outlets and includes a Coach care card. Coach does not include a dust cover bag. Coach's Cora Domed Satchel is crafted of vibrant Cardinal Red cross-grain finished leather with polished golden tone hardware. 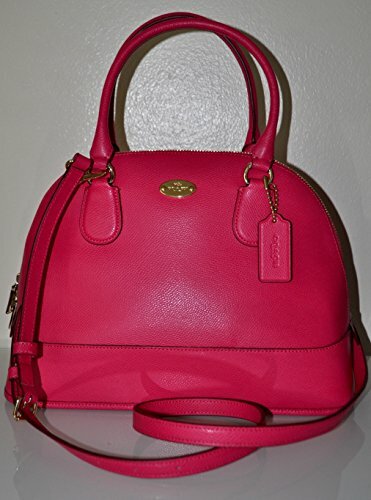 Coach offers this dome satchel in several sizes and this is the largest. The lined interior features a zippered pocket and two open slip pockets. Coach's creed and authenticity patch is sewn inside. It has a fully zippered top closure with dual zipper pulls, and Coach's logo lozenge accents the front. A small open slip pocket is on the back, and there's a removable Coach leather hang tag. There are dual handles with a drop of about 4.5 inches, or you can use the longer, removable and adjustable shoulder & cross-body strap with a drop of between 20-24 inches. This gem measures approximately 12 inches (L) x 9 inches (H) x 5 inches (W). It is made exclusively by Coach for distribution in their Coach Outlets and includes a Coach care card. Coach does not include a dust cover bag. Wrapped in gorgeous deep Sherry Red glazed saffiano finished leather with brass tone hardware. The fine cross-hatching finish makes for a very durable, easy to wipe clean leather. 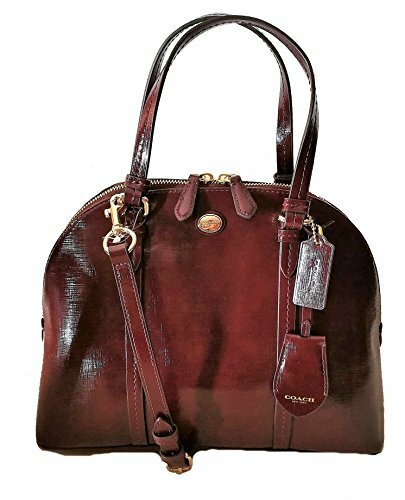 This compact Cora Domed Satchel has a lined interior with a zippered pocket and two open slip pockets. It has a fully zippered top with dual zipper pulls, Coach's logo lozenge on the front and an open slip pocket on the back. Four metal feet help protect the bottom of your bag. Dual handles have a drop of about 5", or you can use the removable and adjustable shoulder / cross-body strap. Overall measurements of approximately 12 1/2" (L) x 9" (H) x 5 1/2" (W). This newest version of Coach's MINI Cora Domed Satchel is wrapped in apricot tone cross grain leather with polished golden tone hardware. 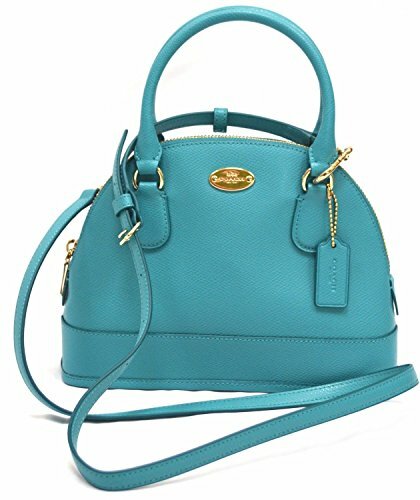 Coach offers this dome satchel in several sizes and this is the smallest. The lined interior features a zippered pocket and an open slip pocket. Coach's creed and authenticity patch is sewn inside. It has a fully zippered top closure with Coach's logo lozenge accenting the front. Off-white tone leather banding runs along the lower edge and bottom providing a very classic and tailored look. There are dual handles with a drop of about 3.25 inches, or you can use the longer, removable and adjustable shoulder / cross-body strap with a drop of between 22-24 inches. This small gem measures approximately 9.5 inches (L) x 7 inches (H) x 3 inches (W). 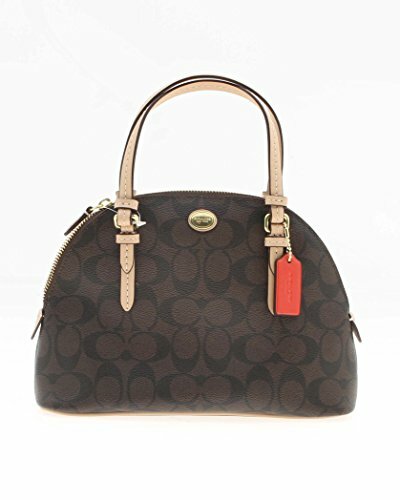 This newest version of Coach's MINI Cora Domed Satchel is wrapped in brown Signature C printed PVC coated canvas with black leather trim and golden tone hardware. 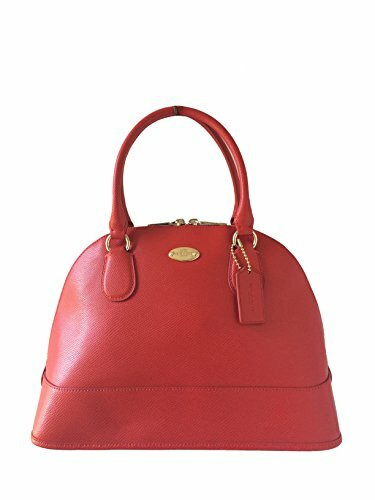 Coach offers this dome satchel in several sizes and this is the smaller. The lined interior features a zippered pocket and an open slip pocket. Coach's creed and authenticity patch is sewn inside. It has a fully zippered top closure with Coach's logo lozenge accenting the front. Black leather banding runs along the lower edge providing a very classic and tailored look. There are dual handles with a drop of about 3.25 inches, or you can use the longer, removable and adjustable shoulder and cross-body strap with a drop of between 22-24 inches. This small gem measures approximately 9.5 inches (L) x 7 inches (H) x 3 inches (W). This newest version of Coach's MINI Cora Domed Satchel is wrapped in Cadet blue cross-grain leather with polished golden tone hardware. 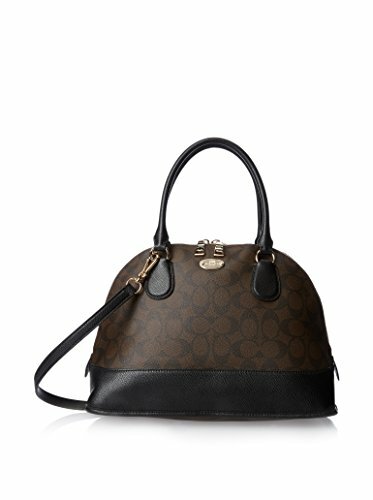 Coach offers this dome satchel in several sizes and this is the smaller. The lined interior features a zippered pocket and an open slip pocket. Coach's creed and authenticity patch is sewn inside. It has a fully zippered top closure with Coach's logo lozenge and a hang tag accenting the front. Leather banding runs along the lower edge and bottom providing a very classic and tailored look. There are dual handles with a drop of about 3.25 inches, or you can use the longer, removable and adjustable shoulder and cross-body strap with a drop of between 22-24 inches. This small gem measures approximately 9.5 inches (L) x 7 inches (H) x 3 inches (W). Compare prices on Domed Satchel Coach at ShoppinGent.com – use promo codes and coupons for best offers and deals. Start smart buying with ShoppinGent.com right now and choose your golden price on every purchase.